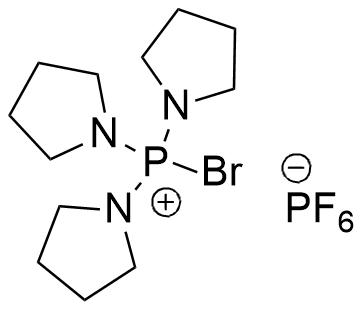 The halogenphosphonium coupling reagent PyBrOP was developed as an alternative to the BOP reagent, avoiding the release of the toxic HMPA in the activation step. PyBrOP often gives better results than other phosphonium-HOBt reagents, for the coupling of N-methylated amino acids. PyBrOP, as other phosphonium salts, cannot react with free amine function and therefore does not terminate the peptide growing as the aminium salts do, through the formation of guanidine derivatives. J. Coste, E. Frerot, P. Jouin J. Org. Chem., 1994, 59 (9), pp 2437–2446.